Fashion is a huge subject. It was dependent on the area of the world lived in, the class or profession of the wearer, whether they were male or female, required formal or informal attire and the technologies and materials available for manufacturing the garments. And yet, in many ways imperial fashion was a slave to the fashions of 'high society' of cosmopolitan Britain. It was remarkable for how often it did not adapt to the environment or climate lived in. British subjects in particular were often loathe to adapt their dress for fear of losing their claim to 'civilisation' and connection to British culture. They would rather sit in high collar suits with jackets in sweltering temperatures on the equator than be accused of 'going native'. There was often a time-lag for fashions to be followed in the colonies, but anything that was fashionable in London would be sure to find itself being replicated and mimicked in imperial capitals and centres across the world. Of course, there were a few examples of local traditions and customs affecting British fashion - although this was rarely in formal attire. Probably the best example (and the most informal clothes imaginable) was the adaptation and adoption of pyjamas. These loose-fitting clothes were highly suitable to the hot and stuffy Indian sub-continent and yet they were comfortable enough that those people exposed to their use were keen to continue using them even when they returned to cooler climates. The fashion soon caught on and itself spread to the other colonies and beyond. Sometimes, weather was so uncompromising that adaptations to the local climate would become a necessity. Furs became popular in Canada; pith helmets were considered essential in India and Africa; slouch hats were the most practical headgear in the more inhospitable parts of Southern Africa or Australia. British fashion was more likely to affect local fashion than the other way around - or at least the fashion of those who aspired to work in or for the administration or imperial companies. Some Chinese would adapt to wearing trouser suits in Singapore or Hong Kong. Bowler hats or even top hats would be a mark to signify identification with the imperial project. If you wanted to win a contract or a job then you had to appear that you were comfortable in the European business fashions of the day. Below, you will find an outline of the fashions in Britain and how they were adapted (or not) and disseminated around the wider empire. It is chronologically ordered, but there were significant time lags and variations from colony to colony. Tudor dress was highly dependent upon the wearer's social class. The upper classes wore fantastically elaborate fashions of rich colours and sumptuous fabrics which were bejewelled and highly decorated. 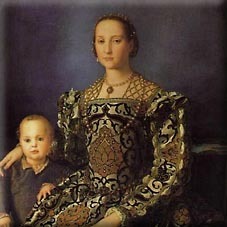 Male dress was frequently more extravagant than female dress. Frilled collars and cuffs were a sign of wealth and sophistication. England had recently been enriched by the dissolution of the monasteries and yet the legacy of Catholic Europe was still a strong and powerful influence. Spain and Portugal were the richest and most successful European nations and dominated the cultural aspirations of even the English elite. It is interesting to consider that the wealth of Spain and Portugal was largely as a result of their own empires in the New World and the Spice Islands. English explorers and seamen were keen to tap into those sources of wealth and followed and raided their Catholic rivals on the high seas and in outposts across the world. The lower classes wore very basic woollen clothes with very basic colours. However, this was the period before these classes settled in the new colonies, however they could and did man the crews of the gentlemen explorers or privateers outlined above. 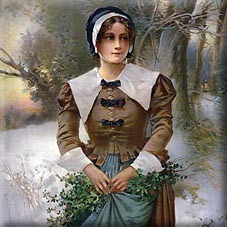 Back in England, the fashions were designed around living in a cold climate in which it was difficult to keep warm - even when inside their houses. It was not uncommon for Tudor men to wear five layers of clothing in an attempt to keep warm. These multiple layers would be maintained by mariners even as they crossed the tropics and the equator. Sophstication was more important than comfort. With the accession of the House of Stuart in 1603, fashion became even more elaborate than in Tudor times. James I was actually referred to as the 'Foppish King' and his court were keen to emulate the style. This was a period in which effeminacy seemed to the dominant characteristic - even for the men. The ruling classes were becoming more removed from the feudal obligations of the Medieval period and so did not have to be ready to go to battle in full length plate armour. By this time, gunpowder and pistols had made armour all but redundant. Although the 'doublet' of the Stuart period was a hangover from the days of armour. It had originally been used as padding beneath armour - but it carried on until this period. The weapon of choice for a gentleman at this time would be the foil or the rapier. These were small and light weapons that required rapid movement and relatively free movement of the arms. Again, this had an impact on the fashion of the day. Stockings would give the freedom to move legs and feet with agility and speed. Capes would not be just used for warmth, but could also double up as a makeshift shield or barrier against the light swords of their adversaries. These items of clothes would all be highly elaborately embroidered - new silks and fabrics were being brought back from the New World and beyond. Having the finest lace gloves or new colours would be a way of showing that you were a cultured and successful gentleman who had access to the very latest designs and imports. You were someone to be respected. Hats would become more important, often with wide brims and adorned with exotic feathers. Similarly, boots made from soft leather and turned over at the top. Indeed, this headress and footwear would become the unofficial but very real motif of the Royalist Cavaliers as they went into battle during the English Civil Wars of the 1640s. Women would have to endure stiff bodices although the hooped skirts that they often supported began to diminish in size and in some cases disappear altogether to be replaced by slightly more comfortable hip pads. Lace would become even more important for women than it would be for the men, and the more elaborate the better. The Seventeenth Century saw something of a cultural battlefield between different religionists who were fighting for the soul of the country. Technically, this was no longer a battle between Catholics and Protestants. The Protestants had all but won that battle; this was more a battle between the various types of Protestantism on offer. In particular, it was Anglicans versus Puritans, although there were many other shades at play. The aristocracy and royal family were very much associated with Anglicanism, and their decadent and elaborate fashions alienated the plainer and simpler Puritans. The Puritans also regarded Anglican copying and mimicking of the continental styles of France or Spain as dangerously verging on Catholicism and Popery. Puritan fashion would follow their ideology. They eschewed elaborateness or anything that was superficial in any way. Function would reign over form. They preferred dark or plain colours. Modesty was paramount. There was not a great deal of difference between formal and work wear. Plain and simple were the dominant forces at work and these contrasted starkly with the fashion of the Anglican aristocracy. You could even tell the difference on the battlefield as each referred to the other with what they regarded as derogatory terms - althouth the recipients often revelled in them. Hence, the King's supporters would refer to Parliament's forces as Roundheads as they were so unsophisticated they had such a boring hairstyle. Likewise, the parliamentary forces referred to the King's supporters as being Cavaliers - Italian dandies on horseback - all show and no action. It is interesting to note that both communities would cross the Atlantic to the new colonies developing in North America - although the Puritans would gravitate northwards whilst the Anglicans tended to coalesce in the Central and Southern colonies of North America. The puritans were attempting to escape religious control whilst the Anglicans were trying to recreate a microcosm of England on the other side of the Atlantic - needless to say, they both took their fashions with them - contrasting as they may have been. With the victory of the Parliamentary forces back in England, conservative dress would become the norm. Anyone attempting to dress elaborately in the 1650s would have found it very difficult to avoid being arrested or detained. Fashion became a way of showing who the winners and losers were. Black was back! With the death of Oliver Cromwell and his unsuccessful replacement by his son, the English army was tempted to invite the royal family back from its exile in France - with conditions of course. The 'worthy' Puritan experiment had exhausted the country's tolerance towards the plain and simple. The country wanted some colour back in its life and King Charles II would bring exactly that. He would also bring the latest French fashions with him. Having been cocooned on the continent, he had been exposed to the rising power and influence of the French court. He was keen to bring some of that sophistication back to England, although not too much - he did understand that the country had changed forever. He kept much of his decadent lifestyle firmly behind closed doors, keeping a more austere and formal public face. 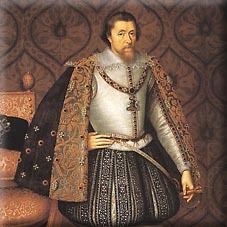 The doublet shortened in this period or was replaced completely by a waistcoat. Probably the most significant introduction was the long coat - and with an abundance of buttons to go with it. The jacket was far more practical for riding, although it still went down to the knees due to the lack of trousers as we would understand the term. Breeches and stockings were the combination of choice. 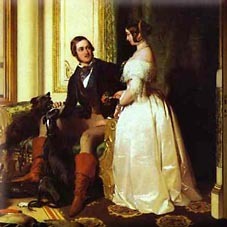 Some of the breeches were fairly wide and resembled petticoats more than short trousers. Dying technology was improving markedly and more vibrant (or subtle) colours were on offer. Headgear saw the introduction of the wig - which started modestly in size, but would grow conspicuously over the coming century. There was a danger that English fashion was going to go back to the ostentatious pre-civil war decadence and opulence. 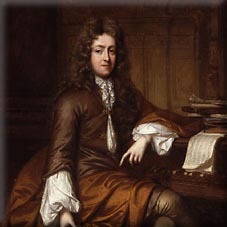 However, the brother of Charles was rash enough to convert to Catholicism in Protestant England and was surprised to find a backlash against him. The country was prepared to be tolerant of his religion whilst it was clear that he had no son and heir, but when his rather elderly wife became pregnant, the English (and predominantly Protestant) army basically conducted a coup and invited the arch-Protestant William of Orange to become the King of England. The arrival of such a stringent ruler saw a return to a more formal and basic fashion - not as severe and plain as the Puritan period had been, but formal nonetheless. It was a curious accident of history that the leading professional tailors and dressmakers in Europe would flee to the relative safety of protestant England at about the same time as the accession of William. Cardinal Mazarin had resumed the violent persecution of the Huguenots in France and the parts of the Low Countries under French control. Many of the Huguenots had long been at the cutting edge of dress-making, colour-dying and embroidery. They would find a welcome home in Britain and the wider colonies and would bring a new level of sophistication to the manufacturing processes. Jackets would continue to be used, but stiffened and looked more businesslike. Likewise, the bodices for women became far more straight and severe. This was certainly a period in which conservative appearance was considered more fitting. One innovation that was introduced was the shoe buckle, brought over from the low countries with William. Wigs did not disappear, but they remained curt and formal. Once again, fashion became a political statement. 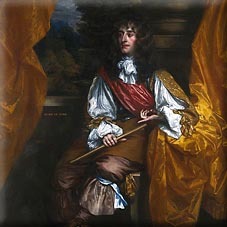 Soft jackets, petticoat breeches, long hair or ostentatious wigs would signal that the wearer was a Jacobite who wanted to see the return of Catholic James to the throne of England. These fashion challenges were more likely to be seen in Ireland and Scotland - or in the Southern colonies of North America - where William's succession had not been fully accepted or appreciated. Fashion would become a test of loyalty. The early Eighteenth Century saw the 'protestant' Hanoverian royal family being invited to become the monarchs of Britain. In many ways they maintained the same restrained fashions of the Williamites. The riding jackets got slightly shorter although not as short as our jackets today. Waistcoats became more widespread. Linen shirts with lace collars made the appearance far more recognisable to our modern eyes. The cuffs of the linen shirts and jackets were the one area where elaboration was allowed or encouraged. They still had to keep the function of being able to be buttoned (or linked) up above the elbow in case of a duel - although duels were as likely to be by pistol as sword in this period. Make-up became an increasingly popular addition to the appearance of both men and women. Complexion was a sure way of showing who had to work for a living or who belonged to the ruling class - lightening the skin or accentuating the contrast from lips to skin colour was one way of marking the ruling classes from the masses. Internationally, it was the French who were setting the pace for fashion. France had replaced Spain as the economic and political powerhouse in Europe and the rise in wealth of its royal family seemed to confirm that transfer of power. Britain's ruling families passed through France on their 'Grand Tours' and were mesmerised by its sophistication and exquisiteness. Roads and communication systems were improving anyway and so it was easier than ever to observe the latest fashions in Paris and have them recreated in Britain or across the Atlantic in New York or Savannah. Huguenots tailors or dress-makers could easily run up new versions or adaptations of the latest French fashions. Macaronis never represented a main stream in fashion; they were a significant minority who took delight in being deliberately over-the-top and ostentatious. They were invariably young men who wanted to shock their elders or the more staid of their peers by wearing deliberately over-the-top French and Italian clothing with huge, imposing wigs. They took their name from the Italian 'maccherone' and indeed many of the members of the so-called Macaroni Club had spent time in the Italian peninsula as part of the 'Grand Tour', considered an essential part of any young man's education. In many ways he did not want to return to the boorish, soporific and enclosed world of the British aristocratic circle. He pined to stay in the more cultured Mediterranean world - being paid for by his parents naturally. 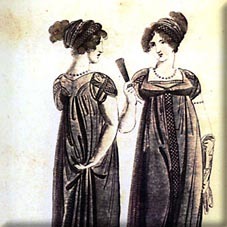 Women during this period might wear a day dress known as Robe a L'Anglaise which was an all-in-one gown of bodice and skirt often with a trim and decorative swirls. 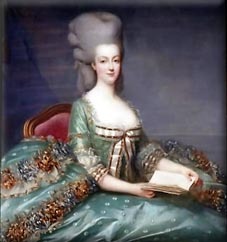 More formal wear would be the Robe a la Francoise which had hoops which filled it out. It was fitted at the torso. The lyrics to the the song 'Yankee Doodle' referred to this same concept of a Macaroni. It was initially used as a put-down of the colonists in general and secessionists in particular. The idea of sticking a feather in your hat and calling yourself a Macaroni was supposed to illustrate the unsophisticated nature of the colonists there. Of course, some of the colonists (especially those descended from the Puritan tradition) were more than happy to use this as a badge of honour rather than as something to be ashamed of. The song nicely illustrates the cultural rift that would end in revolution in the thirteen colonies. It should be remembered though that back in Britain these same Macaronis were regarded as being little more than immature high spiritedness. On the French side of the channel however such decadent and ostentatious flaunting of wealth would end in a far more consequential revolution - and an event that would change British and imperial fashion for good. When it was clear that French aristocrats were being executed wholesale by 'the mob', the British aristocracy was understandably nervous. Wigs were hidden away and replaced by black top hats. Frippery became a bad word; lace, silk or any elaborate designs were jettisoned in favour of dark, austere colours. Jackets took on correspondingly dark coloured cuffs and collars. Pantaloons began to be worn and began their transformation into the trousers with which we are more familiar with today. This was to be a period of sobriety. Women's fashion took an equally radical turn to conservatism. French fashions were obviously thrown out the window - they had inspired the mob but were also the enemy now. Greek fashions took their place, or rather Ancient Greek fashions became a satisfactorily elegant but simple compromise. Greece itself had been an important destination on the 'Grand Tour' that many aristocrats had embarked upon. It still showed sophistication but in not nearly as provocative a manner. The clothing also suited the architectural style of Palladianism; the style in which many of their houses had been built in. The chemise dress had a suitably high waistline so as to not accentuate the feminine form too much and yet it still maintained an elegant daintiness. Shawls could be added for warmth - but these would be in simple designs that might be familiar to the lower classes. These might be accompanied by the Apollo Knot - a classical hairstyle familiar to any who have seen Classical greek pottery. Bonnets and frilled caps might also be used, but wigs were certainly removed and hidden away. Accessories in general were minimised, the main exception being the parasol which had a functional role and might also be used to avoid eye contact and hide features from passers-by, especially if they are from lower classes. Military braiding and styles might also become features during this suitably militaristic age with war raging permanently across the continent. Even after the war had been won, there was to be no turning the clock back to the decadent fashions before the Revolution. There was a brief relaxation in tastes but the French Revolution would haunt the Nineteenth Century and would change the relationship between the rulers and ruled forever - even in those countries which had avoided revolution. Austerity, piety and service would become the watchwords of the ruling classes. Jackets would shorten for the men, although they could still keep long tails. Combined with the pantaloons, they made ideal clothes for riding horses in. These would basically form a slightly more formal look, but had all the recognisable traits of the business suit that it so prevalent around the world to this day. Women's waistlines began to move downwards slowly but surely. They finally reached the waistline itself by about 1825 - although the dresses themselves would reach firmly to the floor. Pelisses were worn, as were carriage cloaks and pelerines, and they maintained the maidenly sun-bonnets. A wider range of colours was used, but not bright or vulgar ones. They tended to be pastels or solid colours although sometimes with adornment. The watchword would be elegance. The industrial revolution would be at full tilt by this era, and mass production meant that bolts of cloth could be manufactured at ever lower prices. 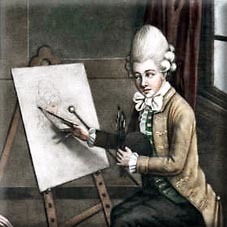 If anything, this led to yet more homogenisation in fashions and brought many of the so-called high society fashions into the budgets of aspiring middle classes and even succesful artisan classes. Machines were not versatile enough to mass produce the clothes themselves and most were still made by an army of seamstresses, milliners, tailors, hatters, glovers, corsetiers, and many other specialized tradespeople. 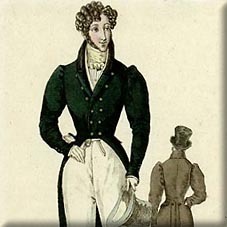 In the 1830s, men might wear wasp waist and frock coats. Shirts were usually made of linen and were black, grey or other neutral colours.